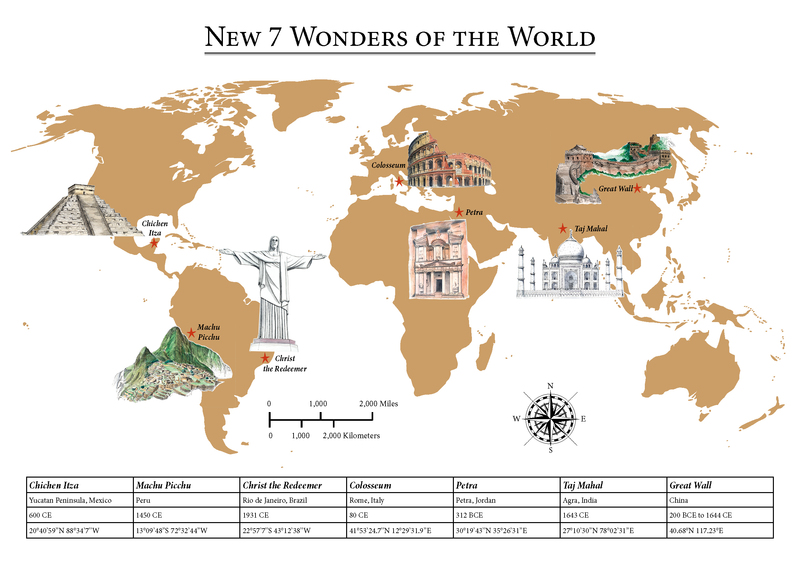 In advance of #7Wondersday, which is held, every year, on 7 July, I bring you my modest contribution to the celebration of our World Heritage: a new hand-drawn map representing the New Wonders of the World. Click and zoom to see the details! 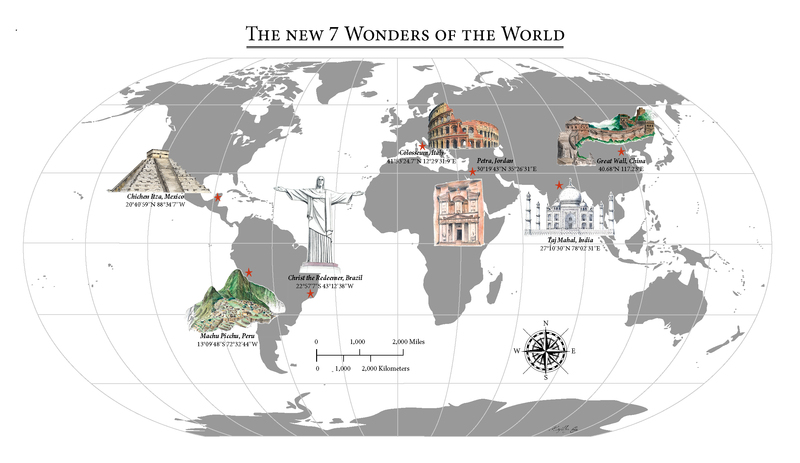 The New 7 Wonders of the World was a private initiative launched by a Swiss foundation. It started in 2000 and the winners of the popularity poll were announced on 7 July 2007. You can find out more on www.RoadTripsaroundtheWorld.com where you will also be able to download the map. Still working on it actually! I know this is bad, but I couldn’t resit sharing these maps, although they are still work in progress! It took me so long to finish the drawings and to put the the whole thing together, that, even if it’s not perfect, I still wanted to get it out. It’s such a relief to get it out!! Anyway, here is one version of the map. I’m still playing around with colors and little details. Unsure what works best really! I drew the 7 wonders by hand. They are in A4 format. This, for a start, was was so stressing! The more drawings were done, the more stress! I was scared it would not work out or I would mess one up. Petra and the Colosseum took me something like 10 hours each to draw. You can easily understand that I did not want to have to redo! Meanwhile, when I couldn’t draw, I was recreating the World map on Illustrator. I then finalized the map by importing everything into Indesign. I know I could have done it all in Photoshop, but I’m just not good enough with it. And that’s when things got ugly! My first tests were horrible… I was crying of despair. Having spent so much time on the whole thing to end up with something that doesn’t work broke my heart! And you know my heart doesn’t need further breaking, nowadays. “OK, cry some more & sleep on it” I thought to myself. And I guess after several nights of sleep, it kind of worked! I’m still not 100% satisfied, but it’s getting there! Pffff what a challenge. Now I wonder why I do this to myself!?! Considering I was scared to mess up when adding color to my drawings, I decided to handle things, in a bit of a weird way. Once the drawings were all done, I added the shading in aquarelle. I photographed and photoshopped all of them and since these were ok, it gave me a minute or 2 of relief! Then and only then, did I apply to colors! I know it’s weird and I would not recommend this process! It was tricky to reapply color, especially on the drawing of Petra. At least, now I have clean black and white versions of these sites! There are more goodies on www.RoadTripsaroundtheWorld.com, like individual sites drawings and montage. Well of course I have already added some of those designs to my Society6 shop. I’ll add the maps as soon as finished. Society6 recently added wood wall art. These are a bit expensive but it looks so cool! I’ll have to update my shop to add my other designs there. Society6 also recently added stickers and that is going to be fun! That’s it for now. I hope you like this new map in progress!